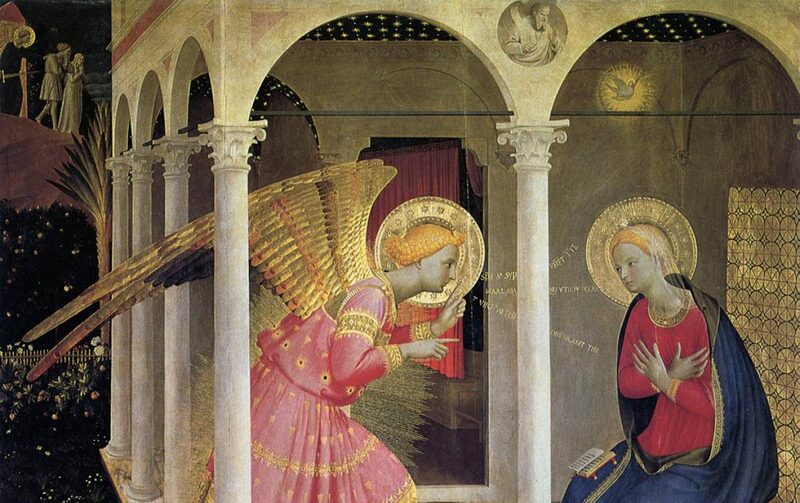 Teresa Rice, prolific essayist and insightful commentator at the catholibertarian.com blog has nominated The Fra Angelico Institute for the Sacred Arts for the Lumen Christi award. This is our fourth award nomination, and I must say, I am also deeply touched an honored by it. Thank you very much. I am told that I must answer three questions, and then nominate another blogger. First, “the name of my favorite saint,” well, its a split decision: St. Thomas Aquinas and Beato Fra Angelico. For Aquinas expressed the truth, goodness, and beauty of God through scholarship and Angelico expressed it through artistic creativity. Second, “Name my favorite part of the Mass”: the moment of the Consecration of the Holy Eucharist and Precious Blood and then my reception of the Divine Presence; the Eucharist – “the Source and Summit” of Our Faith. Third, “My favorite part of being a Catholic.” I hope my answer does not fall into the category of spiritual pride. “The favorite part” is the knowledge that, over a two thousand year period, the truths that Jesus Christ handed down to the Apostles have been continuously protected, expressed, evangelized, and elucidated by elegant teachers of the Church – in both the Latin and Greek Rites. These teachers were not afraid to explore the meaning of our faith as well as investigate and contribute to secular fields of study. Fine Catholic men and women have contributed much to world civilization; and with God’s help, will continue to do so in the future. My nomination: I nominate the blog called The Pulpit: bigpulpit.com It is compiled by Tito Benedictus and it is one of the finest resources for insightful, meaningful, and always thought provoking articles from around the Catholic world: Latin Rite, Eastern Rites, Coptics, and the Orthodox Rite. It is truly a cornucopia of information. Check it out! Congratulations to you! It is indeed well-deserved. Thank you very much; and thanks for taking the time to ponder the ideas in my essays. I am always grateful for feedback. Thanks very much; keep your lamps oiled!